Release Date: September 29th, 2006 by The Weinstein Company. The Cast: Jon Heder, Billy Bob Thornton, Jacinda Barrett, Michael Clarke Duncan, Luis Guzman, Sarah Silverman, Todd Louiso, Horatio Sanz, Matt Walsh. BASIC PREMISE: Roger (Heder) enrolls in a confidence-boosting course and competes with the instructor, Dr.P (Thornton), for the same beautiful girl, Amanda (Barrett). 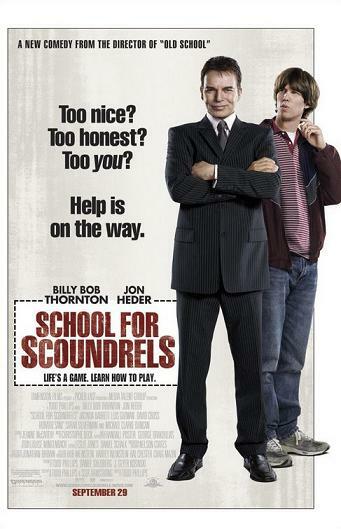 ENTERTAINMENT VALUE: School for Scoundrels has moments of hilarity, but, for the most part, it the jokes seem too silly and recycled. Jon Heder plays Roger, a geeky parking inspector who can’t stand up for himself or even talk to the beautiful girl in his apartment, Amanda. So, he enrolls in a confidence-boosting class led by Dr.P, a pompous older man who thinks that he’s omniscious and omnipotent when it comes to scoring with women. Dr.P provides instructions list to woo women which includes being dangerous and lying. After one date, Roger has already fallen in love with Amanda, but, soon enough, Dr.P steals her away. What follows is one juvenile joke after another as Roger tries to get Amanda back while Dr.P constantly finds low brow ways to humiliate him—i.e. forging a love letter to his Roger’s boss which gets him fired for sexual harassment. Co-writer/director Todd Phillips has the imagination of a 6-year-old when it comes to humor—how many times can hits to the groin be funny? A brief cameo with Ben Stiller and some scenes with Sarah Silverman don’t add much in terms of comedy. The doubles match tennis scene in particular drags on for too long with juvenile humor. At least Billy Bob Thornton adds some comic energy with his mean shtick, but Jon Heder’s goofy shtick gets old and annoying pretty quickly. IN A NUTSHELL: Mildly entertaining thanks to Billy Bob Thornton’s comic energy, but the repetitious juvenile humor gets old too quickly.